Makers are slowly but surely helping to regenerate the city of Detroit, which collapsed with the auto industry. 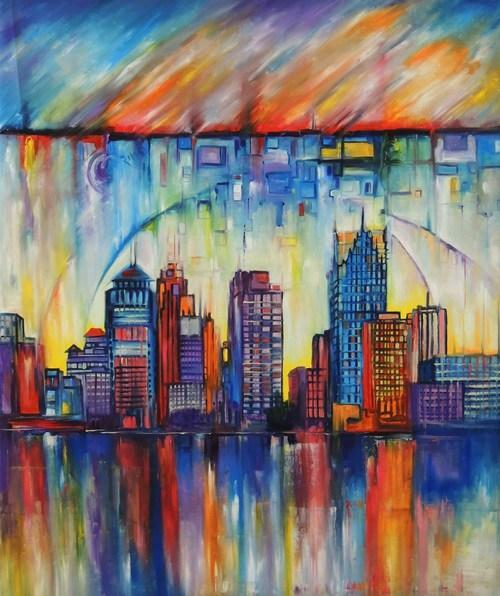 Since the Michigan metropolis went under largely because it relied on a single corporate industry, diversification by creativity seems a fitting antidote. “When you take a city down to a low point, it requires such an enormous amount of heart and soul to rebuild,” says Shane Douglas of Douglas & Co., a designer and hand-maker of fine leather goods in Detroit. "Many people abandoned this city and ripped the ground out from under it. Those who remained are passion-driven people–artists, creators, and crafters who use their pleasures as a vehicle for business. There is such strength behind that kind of work. It is no longer just a hobby," Douglas says, reflecting on the vitality of the city’s patriots. “No dream is too big for Detroit,” says his wife Melissa, an artist and lifetime Metro Detroiter and co-founder of Douglas & Co.
Creatives from other cities are even moving in now. Brooklyn-born-and-bred Galapagos Art Space is relocating its 20-year-old performance center to Detroit after being priced out of New York. Galapagos bought nine buildings totaling 600,000 square feet and has plans to create a 10,000 square-foot lake near Detroit’s Corktown in an area some refer to as the “Hubbard-Richard” neighborhood. Galapagos Executive Director Robert Elmes told the New York Times they bought the buildings for the price of a “small apartment in New York City” at the time. Among the buildings is “an old power plant that looks like a little Tate Modern,” Elmes said. Galapagos helped put Williamsburg, Brooklyn on the art map. Now it’ll give Detroit cache.